This thesis offers a philosophical perspective on the different conceptions of agency and choice as they are understood and employed in economics and behavioral decision research—this perspective is two-fold: on the one hand, philosophical analysis can clarify ambiguities in definitions and concepts that can and do arise within interdisciplinary research. 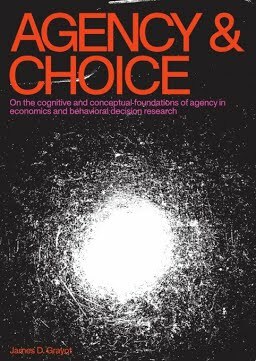 This is of particular importance given how philosophical concepts such as mind, cognition, and intentionality feature in economic studies of rational choice. Hence, one project of this thesis is to subject contemporary research on questions about agency and choice to such philosophical scrutiny. On the other hand, the questions and topics discussed in this thesis can be understood as an exercise in philosophy of science: they deal explicitly with questions and topics that pertain to the theoretical and empirical practices of scientists. This includes traditional microeconomic disciplines, such as decision and game theory, as well as interdisciplinary collaborations in behavioral economics, neuroeconomics, and experimental psychology.